Allied Tube is the leading supplier of galvanized and commercial quality tubing to both manufacturers and metal distributors in many commercial and industrial markets. Our signature Flo-Coat galvanizing process produces superior corrosion resistance by utilizing a triple-layer of protection. First 99.99% pure zinc is applied, followed by a conversion coating. Finishing the process is a clear organic topcoat that seals in the protection and produces a smooth shiny appearance. This galvanizing process is performed on the mill to produce a finished product that does not require secondary operations such as batch hot-dip galvanizing. Allied Tube has successfully employed these techniques to transform industry and product standards. The Allied Tube product portfolio has grown substantially since our inception, benefitting customers with a growing number of tubing and roll form products. We are always dedicated to providing the same high-quality workmanship and customer dedication that you have come to expect from our organization. Please browse our offerings and experience the benefit of Allied Tube. Refer to the Allied Tube & Conduit weight per foot chart for specific OD and gauge combinations. 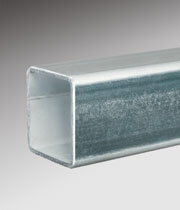 Flo-Coat galvanized steel tubing is the original in-line galvanized product. 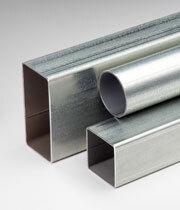 It is manufactured using the advanced processing technique of in-line galvanizing. 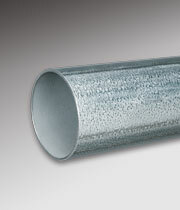 Gatorshield galvanized steel tubing is derived from Allied's original Flo-Coat galvanized tubing product. It is created by adding 50% more Western grade pure zinc to the original process. 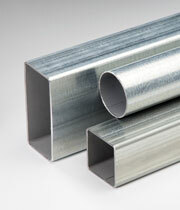 Gatorshield Plus galvanized tubing offers even greater corrosion protection. The product has been designed for use in straight applications in the most caustic of environments. Square-Fit telescoping square tubing is a versatile and cost effective choice. Its unique telescoping action gives flexibility in design and assembly of your products. 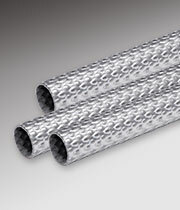 Tectron tubing is used in a multitude of applications. These uses range from everyday functional items to high performance products such as office furniture, cafeteria tables, ATV's, lawn mowers, etc. Sign support system designed to be impacted from any direction. Field fit ready with the ability to hold up to 72 sqft of sign area per post in a 90 mph wind zone. Meets MASH Test Level 3. The Telespar Square Sign Post is available with two types of posts: galvanized steel tubing with perforated holes on all four sides and Qwik-Punch posts which are made with knockouts on all 4 sides. The Telespar round sign support system with socket and wedge provides superior corrosion resistance and strength benefits, demonstrating 50ksi yield strength. The Telespar Sign Support System is complemented by a variety of compatible fittings, accessories, nuts, bolts and simple installation tools.